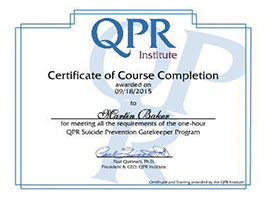 Following on from my blogs on the excellent Mental Health First Aid (MHFA) and Applied Suicide Intervention Skills Training (ASIST) workshops, I’d like to share my experience of the QPR Gatekeeper course, which I successfully completed online last week. QPR Gatekeeper training (the acronym stands for Question, Persuade, Refer) is one of several suicide prevention training programs developed by the QPR Institute. The course costs $29.95 (approx £12.85) on the QPR website but it is offered for free by some organisations including Hope for Life. A Gatekeeper is someone in a position to recognize a crisis and the warning signs that someone may be contemplating suicide. According to the website, Gatekeepers include parents, friends, neighbors, teachers, ministers, doctors, nurses, office supervisors ... pretty much any of us, in fact. Our mission is to save lives and reduce suicidal behaviors by providing innovative, practical and proven suicide prevention training. We believe that quality education empowers all people, regardless of their background, to make a positive difference in the life of someone they know. This is a self-paced online course which will take around an hour to complete (you can stop the course and come back to it later). There is a multi-choice test at the end (pass mark 80%). You can review the course modules and retake the exam as many times as necessary. There is a printable certificate on successful completion, downloadable resources and a free downloadable book, Suicide: The Forever Decision by Paul G. Quinnett (this book also can be downloaded for free from the QPR store page). Having previously taken the two day Mental Health First Aid (MHFA) and Applied Suicide Intervention Skills Training (ASIST) workshops, I found QPR a valuable refresher and it would be a useful introduction to the subject. Like ASIST, QPR focuses on recognising that someone may be experiencing suicidal thoughts, and engaging positively with them. Both ASIST and QPR place significant emphasis on confirming whether, in fact, the person is thinking of taking their life, if necessary by asking the question plainly. QPR is clear that it teaches how to recognise and confirm the presence of suicidal thinking, but not how to assess the severity of that risk. Once suicidal thinking has been confirmed (the Question part) the emphasis is on persuading the person to seek help, and referring them on for professional support. It is hard to put a price on information that could potentially save lives, but I do feel the cost of the course on the QPR website ($29.95, approx £12.85) is high for a short online course and could dissuade people from taking it. For me, the esuicideTALK course by LivingWorks ($20, approx £12.88) offers more for less (but note that some organisations offer the QPR Gatekeeper course for free, including Hope for Life). Background information: available as a PDF download, QPR Gatekeeper Training for Suicide Prevention: The Model, Theory and Research by Paul Quinnett offers background information on the QPR program, and suicide prevention in general.